Don’t Throw that Away! OCC Challenge! It was my turn to choose the theme for the OCC challenge this week. I’m always saving packaging, cans, boxes and lots of other goodies that would normally be tossed or recycled. I’m even running out of places to store everything! So this week the challenge is to use something you would normally throw away. Not just something you saved that was designed to be reused but something destined for the garbage or blue box otherwise. This was repurposed from a cardboard tube which used to hold stickers at my LSS. I created a new bottom and I’ll use it for the Copic markers I never want to put away until I’m finished my project; they always seem to cover half my desk! Another exciting thing about this week’s challenge! We have a SPONSOR! Doodle Pantry agreed to sponsor the team so the winner of this week’s challenge gets a $10 Gift Certificate to the store! Isn’t that awesome! If you’ve never used digi stamps before, there are clear instruction on the website. Did you know you only need MS Word or Publisher (and possibly other word pro programs) to use digis? No fancy program is needed and it is soooo easy! So I hope you will come out and play with us this week! 1. Paint top and bottom edges as well as inside of tube. 2. Cut a scalloped circle out of stiff box board or Craft-a-board large enough to show underneath the tube. Paint. 3. Cut a cardstock circle at least ½” larger than the bottom of the tube. You won’t see it unless you look directly down into the can so colour doesn’t matter much but I recommend you use the heaviest cardstock you have. 4. Place cardstock circle under the tube with the excess evenly spaced. Trace with a pencil INSIDE the tube. 5. Score along the line you drew with a bone folder or embossing tool. 6. Clip the circle up to the line about every 3/8”. 7. Apply Extreme Tac adhesive refill to most of each tab but do not cover completely or the next step will be tricky. 8. Fold tabs up, use tweezers if needed. 9. Insert the cardstock circle into the bottom of the tube, tucking in a few tabs at a time. You want the bottom flush with the bottom of the tube. 10. Apply Extreme Tac adhesive squares to the bottom of the cardstock and tube placing them so the squares touch both the cardstock bottom and the bottom edge of the can. 11. Apply scalloped circle bottom. 12. Apply your choice of papers and embellishments to the outside of the of the can using Extreme Tac adhesive refill and decorate. Wonderful work – very creative and so, so pretty. Marvelous idea. What a perfect container for you Copics! 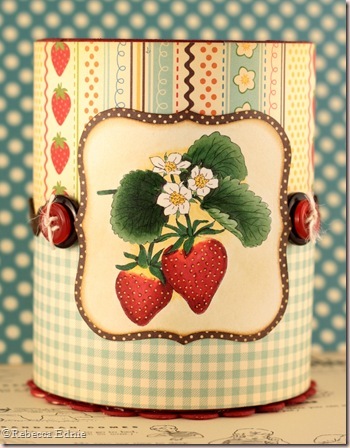 The paper you used goes so well with those strawberries! Lovely creation! Oh my, your image just pops! It looks fantastic against your background papers. Awesome project, Rebecca! I love this! I really think it is beautiful and such a great idea. What a perfect recycled project! Very pretty! Your coloring is beautiful! Thanks for the fun challenge this week! This is adorable Rebecca!! Your coloring on that sweet image is fantastic!!! So very pretty! Your colors are FAB! Very cool project this week, Rebecca. Love the image and colors you have used. Awesome job coloring the image! Wonderful challenge this week – loved it! Hi Rebecca, I love the papers you used on your project, and your use of the sponsor's digi. What a cute idea! Thanks for hosting a fun challenge!